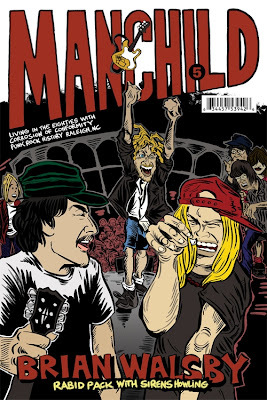 Brian Walsby has a brand new issue of Manchild out but this time around it is way less comic book and much more fanzine; celebrating and documenting the DIY music scene of Raleigh, NC during the mid to late '80s. While some of it reads like an autobiography of a California kid who fell in love with North Carolina's music scene and unbelievably promptly moved there (for most the journey goes the exact opposite, from small town on the East coast to big city on the West coast), a bulk of the book's dialogue is told members of the band's he was friendly with: Corrosion of Conformity, Angels of Epistemology, Superchunk, Erectus Monotone, Ugly Americans, and Honor Role to name a few. Interestingly, Honor Role has more of a guest appearance spot since they were in fact from Richmond, VA but played in Raleigh quite often. Brian didn't feel like the story could be told without including them and in my eyes this is just more proof that HR carries the weight underground legends are made of. I think what appealed to me the most about Brian's collection of anecdotes is how it tells a much larger story; one about how a DIY culture operated before the internet and cell phones. All of the networking that took place between bands and their fans happened either in person or through written letters - letters hand written and mailed. In some ways I think the old fashioned pen pal exchange built friendships in a unique way that made the eventual face to face meetings through touring all the more poignant. I enjoyed reading these stories directly from the people who made it all happen (seriously, he must have spent years digging up all these people) and if the story isn't enough for you, there are tons of killer pictures and cartoons too. Brian's blog / buy it here. More about the contents of this book here.